Agriculture continues to dominate the primary industrial sector in Québec, but this field of activity is changing and must adapt to new socioeconomic realities such as pressure from open markets, numerous technological changes, declining farm incomes, farmers' high debt load, an aging farm population, and a shortage of young and beginning farmers. Another issue is the growing use of outside workers and migrant workers in this sector, where union representation is virtually non-existent and only 40% of farms are covered by the Commission de la santé et de la sécurité du travail du Québec (CSST). The farm is a place where people live as well as work. Therefore, among the issues to consider when developing agri-food policies, safety is of vital concern since it is likely to improve both living and working conditions in the sector. In terms of the scope of injuries, agriculture is one of the economic sectors most at risk. In Canada, it ranks as the fourth most hazardous industry with respect to rates of fatal injury. The advisory documents risk factors specifically associated with farm injuries, that is, injuries associated with agricultural machinery, particularly tractors, as well as injuries associated with falls, animals and working in confined spaces. Effective measures to prevent such injuries (for instance, installing protective structures on tractors) are also discussed, as are certain laws and regulations. 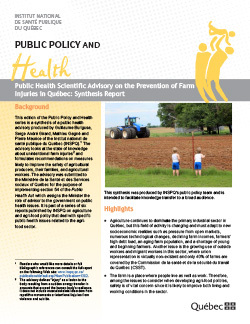 Recommendations on measures to implement to prevent farm injuries in Québec are proposed in the advisory.